This year I dropped by the National Age Groups for the first time. It was a Sunday and I had planned to watch a few games, say hello to a few people and go home but I ended up staying almost the whole day as my family decided to go to Melaka and so left me a little more free than normal. I have always looked at the 14 year olds to provide a benchmark and what I saw was very disappointing from the perspective of seeing talent coming through because there is clearly no progress with 1800 level William Lee winning ahead of Cheong Jie Yao in a play-off. Both of these young men whom I know well must really do a lot more for the rest of the year! A few years ago there were hopes for the likes of Evan Capel and to some extent the rest of his generation of which Lim Zhou Ren and to a lesser extent Sumant Subramaniam could be included but now they would be more occupied with starting college. These former U-18s are more than 2000 but much less than 2200 strength. Arguably there was another group of talent, many who are now over 16, of which Yeap Eng Chiam and Wong Jianwen could be the strongest although the slightly older Mohd Nabil Azman Hisham has in the last year been arguably the most successful, and they are also now our new U-18s! So far they are playing 2000 to about 2100. These are all very experienced players so the question for them is whether they can make a jump to 2200 and beyond. Now to the U-16s won by 15 year old Roshan Ajeet Singh who is probably 2000 strength and so at the moment his track is no different from his predecessors and will almost certainty end up the same as his focus is very much on the PMR exams when this should be the year for him to take a leap forward. 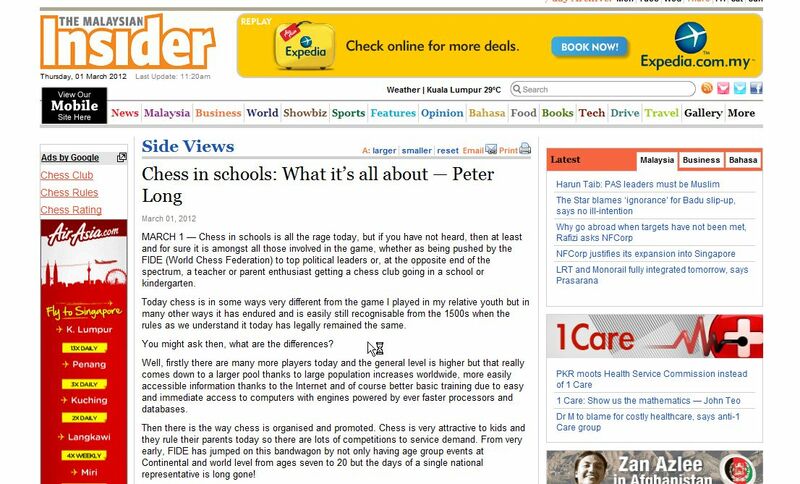 His one year older and main rival is arguably Elgin Lee who as a long time top student will be sitting for the SPM exams a year early and the question for him is whether in the gap year promised by his parents he will make a serious go at chess and get his rating up by the 100-150 points needed. Aaron Teh is a 14 year old Malaysian based in China who has been playing a lot of international tournaments lately and is rated 1900 so the jury is out. Of course we have to include with him our top girl in 15 year old Nur Nabila Azman Hisham. So, even with these small hopes, the pattern does not seem to be changing although I can't pretend to know everyone or have an intimate knowledge of the local scene and so I apologise in advance to anyone whom I have inadvertently missed out, but with due respect it would not change the analysis I have made. Irregardless, as proven by World No. 1 Magnus Carlsen and before him our Asian examples in Eugene Torre, Xie Jun and of course the current World Champion Viswanathan Anand, talent can emerge from simply anywhere and in this context, it is clear that we now have two potential Grandmaster candidates amongst our young. They are Yeoh Li Tian and Nur Najiha Azman Hisham, both who are 13 years old and as we all know, special cases as was with our current No. 1 Mas Hafizulhelmi Abdul Rahman who enjoyed that standing 15 years or so ago. Li Tian has consistently performed at 2200 level and should get to 2300 in the next year or so which would then put him on the same IM track as Singaporeans who also made it like Daniel Chan, Timothy Chan, and Daniel Fernandez. But the challenge he will have is to get the same intensity of training and competition he needs to progress and that is something his parents cannot ensure alone so MCF has to step in and allow him some special privileges and opportunities. Then there is every hope for him making IM at 16 and GM before 21. With Najiha it is even easier. Her rating is 1800+ but in the most important aspects plays more 1900+ and just needs to play at 2100 to become a Woman IM and 2200 to become a Woman GM. So she has plenty of sparing partners at the right level locally already. I don't know what her parents have in mind for her but I am very familiar with working with girls and have a track record, a local example albeit from the past being Audrey Wong who is both our first Asian Champion and WIM, and with also a lot of recent successes working with girls from other countries. So if asked by MCF, I could even guarantee her the WIM title by 16 and the WGM title by 18! Earlier with full cooperation from all parties and with the right tournaments. But of course so could any of our 2300+ players who are systematic in their approach like Jimmy and Yee Weng.